The third chakra is referred to as the solar plexus chakra, because it is located in the solar plexus area of our body. It is specifically located between the bottom of the diaphragm (rib cage) and the navel and is connected to the lumbar vertebrae. Many people simply say the location is the navel. 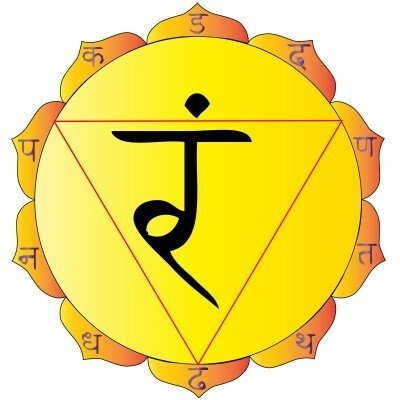 The Sanskrit name for chakra 3 is Manipura chakra. Manipura means "brilliant house" or jewel of the lotus and the symbol for this chakra is a lotus flower with ten petals, as you can see in the image. Each of the 7 chakras is represented by a color, an element, a verb, and a sense and each has a mantra that is connected to it. The color yellow represents the solar plexus chakra. Yellow represents intellectual thinking, which relates to the meaning of the chakra name, "brilliant house". The verb that is associated with this third chakra is "to act" or "to do" and it's corresponding element is fire. Each chakra also governs part of our physical body and our emotional states. The third chakra governs the abdominal organs in the physical vicinity where this chakra is located: the gallbladder, liver, pancreas, spleen and kidneys, as well as the middle of the spine and small intestines. An imbalance in any chakra has an effect on the physical health of the areas it governs. So what happens when chakra 3 is out of balance? The gland governed by the solar plexus chakra is the pancreas. It produces enzymes that are important in the digestion of our food. One of these is the hormone insulin. Insulin regulates the glucose level in our blood (or our blood sugar level). The juices and bile that are released by the pancreas help the body to digest fats, carbohydrates, and proteins. One of the main consequences of a solar plexus chakra that is very out of balance can be the development of diabetes. Pancreatitis, stomach ulcers, intestinal tumors and other colon diseases, liver problems, adrenal imbalances, arthritis, and eating disorders like bulimia and anorexia are other medical problems that signify an imbalance in the third chakra. Chakra 3 also governs many of our emotions and mental states. They include mental acuity (as this chakra represents intellectual thinking), a sense of identity and belonging, vitality, desire, will, a sense of power and ego. If you experience one or more of these problems, you may want to look to an imbalance of the solar plexus chakra as a possible cause: low self esteem and other issues with self image, timidity, fear of rejection, or being over sensitive to criticism. Anger and hostility issues, aggressiveness, or its opposite, passiveness, are also indications that this energy center is out of balance. The gemstones that are said to help balance chakra 3 are topaz, citrine and calcite, all stones that are most often yellow in color. The essential oils that may be an aid for this Manipura chakra energy center include lavender, peppermint, rosemary, chamomile and bergamot. 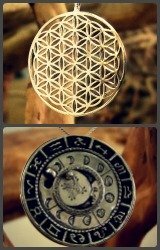 Using them can help to balance the energy in this area. This chakra is all about balance in areas of how we feel about ourselves, including self esteem and feelings of empowerment or lack of power. In fact, the goal of this chakra in our lifetime is to fully experience who we are without the opposite poles of fear or a need to control. Emotions Governed Mental acuity, vitality, desire, sense of identity and sense of belonging, will, power, ego. Lessons to Learn To fully experience who we are without fear or a need to control. Go back to read about Chakra 2, the Sacral Chakra. The fourth chakra or heart chakra is here. The Solar Plexus Chakra is the third of the major chakras. Read more about chakras here.